CARBONDALE, Ill. — Three graduating seniors from Southern Illinois University Carbondale’s School of Art and Design are sharing the 2018 Rickert-Ziebold Trust Award. Kelly Carter of Charles Town, W. Va., Timothy Miller, Evansville, Ind., and Lindsey Perry of Johnston City, were selected from 11 finalists to share the award and an associated $15,000 prize. The three students were recognized during an exhibition reception and award presentation on April 13 in the Studio Arts Building Surplus Gallery, 432 S. Washington, St., Carbondale (formerly the Glove Factory). The exhibition featured work of all 11 Rickert-Ziebold Trust Award finalists. 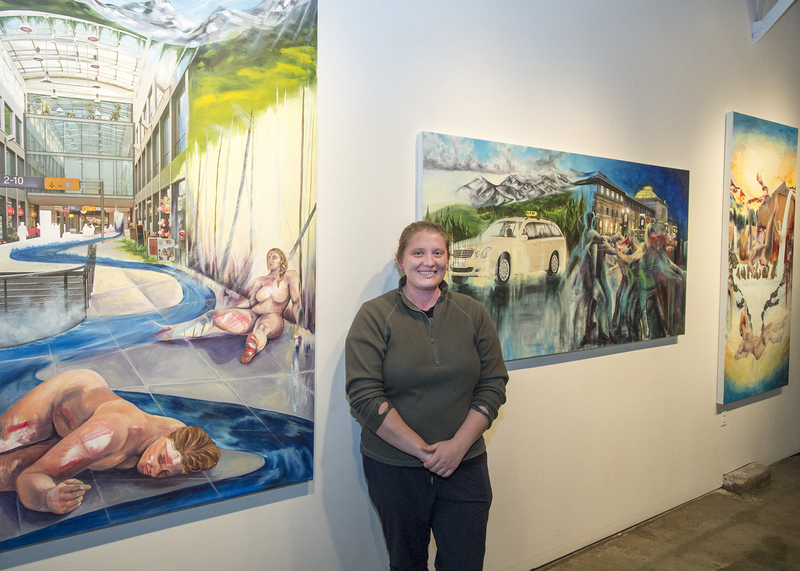 “Let’s Talk About Power” is a series of three paintings, each about 6 feet by 3 feet, that addresses a traumatic event in Carter’s life and the spaces incorporated within that event, she said. Miller’s installation allows the viewer to be conscious of their visual perceptions. 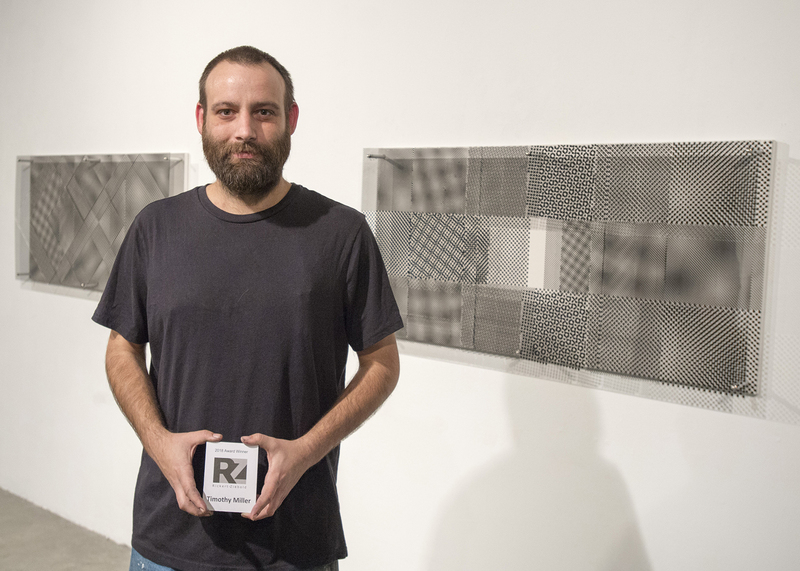 His work uses a configuration of small dots on two different planes, one of which is transparent. The configuration, combined with the viewer’s own movement, generates an optical illusion called a moiré pattern, which is caused when repeating patterns overlap each other. “The Art and Design department has put together a great curriculum which has done a great job at increasing my capabilities as an artist,” said Miller, the son of Cindy Smith and Mark Miller, who has had family members also attend SIU. 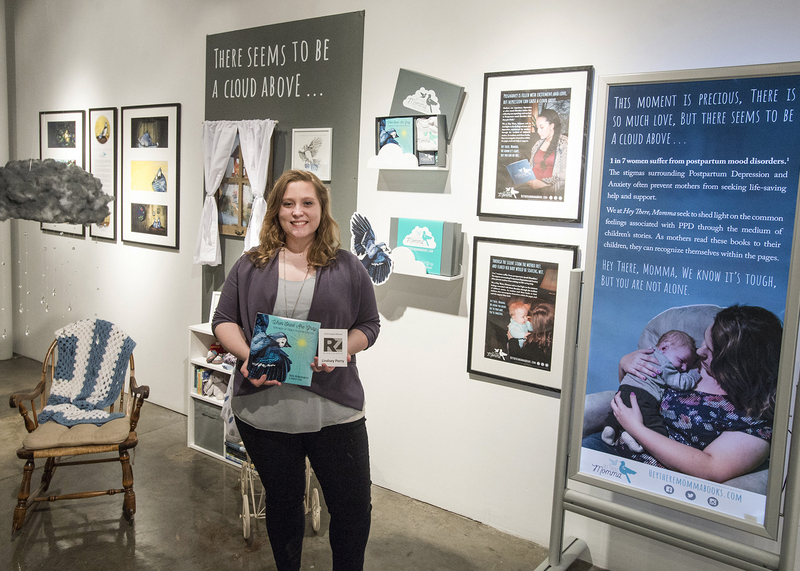 Perry’s installation, “Hey There, Momma,” features the work for a planned book “When Skies are Gray,” which she illustrated. She drew each page by hand in ink and then scanned the drawings into Photoshop, where she digitally painted them, she said. Using the medium of a children’s book, her message is meant to encourage, support and raise awareness about postpartum depression, said Perry, the daughter of Andrea and Tim Hartwell. “I am so honored to be one of the winners,” said Perry, a communication design major, who attended SIU Carbondale after an almost three-year hiatus from college. The awards are made possible through the generosity of the late Joseph Rickert family. Rickert, a prominent lawyer and state senator from Waterloo, Ill., had a personal interest in the arts. Through the family's friendship with Delyte Morris and Henry Shryock, who both served in the role of SIU president (now chancellor), the Rickerts came to appreciate the central role played by Southern Illinois University in the cultural life of the region. This award, established in 1974 in memory of the Rickert family, serves to support and encourage that tradition of excellence. Because of the Rickert family’s vision, love of art, and confidence in the future, the School of Art and Design is able to make an annual distribution of cash awards to outstanding Rickert-Ziebold scholars.